The popular South Philly spot Circles contemporary Asian restaurant opened its second location in Northern Liberties in June. 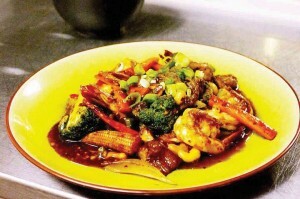 The fusion restaurant’s menu is filled with generous portions of high quality Asian cuisine at inexpensive prices. Eager foodies north of Market Street have been salivating for months over Circles’ new location in Northern Liberties with dreams of the restaurant’s famed twist on traditional Thai cuisine. Its original location on Tasker Street in South Philadelphia has developed a cult following for offering relatively simple Thai and Asian fare like pad thai, spring rolls and fried rice, among others, combined with a holy trinity of things all Philadelphia diners like to have: excellent quality cooking, generous portions and low prices. Taking over the North 2nd Street location of Tuscany Grill & Pizza, Circles has revamped the space to appeal to the neighborhood’s rising standards in elegant dining options. Dining by soft, almost nonexistent candlelight is juxtaposed to the prevailing din of other diners’ conversations and the shining glow of the kitchen near the back of the dining room. Waiters are dressed in traditional Thai garb, and their service is always exceptionally swift and polite. The appetizer my friend and I ordered arrived within minutes. The aptly named summer roll filled with bean sprouts, lettuce and other crisp greens might just be the perfect beginning to a meal in the balmy tropics of Philadelphia during late August. Given the choice between a tofu or shrimp filling, my advice would be to go with the shrimp, as its texture and citrusy flavors go best with the sweet, peanut-laden “summer roll sauce.” Its recipe was apparently confidential,, according to our waitress. For entrees, forego the temptation to go with tried classics like pad thai or fried rice, despite the existing rave reviews of Circles’ interpretations of these dishes. Instead, try any of their expertly seasoned curries over white or brown rice. Two standouts were the red curry, which is a creamy stew served with bamboo, peppers and sweet basil, and the Massaman curry, which is paired with potatoes, onions, and peanuts with hints of ginger and red pepper. Curries are served with the option of tofu, chicken, pork, beef or shrimp for additional prices. Tofu was the ideal consistency between firm and tender, and it is enough to convert any self-avowed omnivore. It complemented the curry broth perfectly without distracting from the intricate flavors of each spice added. In keeping with the exotic and at times incredibly spicy flavors of many of the dishes, a Thai iced coffee or Thai iced tea, served with cream and simple syrup, do just the trick in quenching thirst while introducing bold, inventive flavors that even the most seasoned caffeine addict may not have known existed in the realm of such beverages. If you tire of the traditional cuisine in University City, take an adventure down to Circles’ new location and reward your taste buds with a fresh take on traditional Thai.